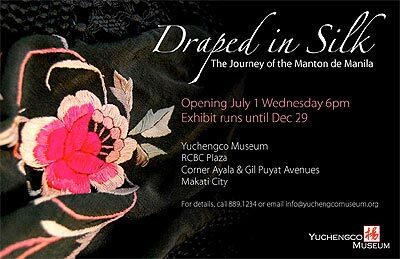 The Yuchengco Museum invites you to the opening of the exhibit Draped in Silk: The Journey of the Manton de Manila on July 1 at 6 p.m.
Draped in Silk narrates the story of a 16th century precious cargo, of Chinese silk embroidery, and of a maritime trade between Asia and Europe. The Philippines, then a Spanish colony, was a port of call for galleons that sailed to and from Mexico. One of the many coveted merchandise brought by these galleons were embroidered silk shawls from China, which were to become known as the Manton de Manila. The dainty and bright embroidery of these Chinese-made shawls captured the imagination of the Spanish from all walks of life, and adapted as part of their fashion and costumes for dance and music. The exhibit explores the many anecdotes surrounding these captivating shawls, including the Manila-Acapulco galleon trade and the manton’s influences on Philippine embroidery traditions. In contrast, artists and designers from various creative fields showcase contemporary works inspired by the manton—from illustrations, paintings, and photography to couture, installations, and décor. Exhibit is open until December 29, 2009. For more information, call 889-1234 or e-mail info@yuchengcomuseum.org.